The Cascade Board adopted the Lake Tapps Reservoir Property Management Policy to address management and use of property owned by Cascade at the Lake Tapps Reservoir. 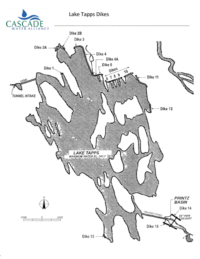 Through the “1954 Deed”, Puget Sound Energy (PSE): conveyed most of the land surrounding the Lake Tapps Reservoir to the Lake Tapps Development Corporation (LTDC); reserved ownership of the land and lake bed below the 545-foot elevation line; and agreed to allow certain recreational uses below that line. In 1958, when the LTDC re-conveyed the dikes back to PSE through the “1958 Easement” , it reserved the right for owners of the property adjacent to the dikes to cross over the dikes to access the Reservoir for recreation. In 2009, Cascade obtained the Reservoir from PSE and now owns all land below the 545′ elevation line and the 15 dikes (subject to the recreation uses allowed in the 1954 Deed and the 1958 Easement). Over the years, many property owners obtained permission from PSE or Cascade to use the Reservoir property below the 545′ foot line for recreational purposes (including docks, bulkheads, landscaping area, etc.). The intent of the policy is to keep Cascade’s property free of any obstructions an unauthorized structures and to ensure that (A) existing improvements do not compromise dike integrity, water quality, environmental health or safety, and public enjoyment; and/or (B) any modifications or new improvements are licensed by Cascade and permitted by other agencies. Cascade will fill out this form using information provided by you. Cascade’s dikes are closed to the general public. Trespassing on these dikes will be subject to enforcement by the Pierce County Sheriff’s Office.